Nintendo's European wing will be consolidated into another German office in Frankfurt. Nintendo of Europe's headquarters in GroÃŸostheim, Germany, has been closed with the loss of 130 jobs, according to an official company statement provided to Eurogamer. The building and warehouses have been sold off, with European operations to be consolidated and run out of Nintendo's Frankfurt office. "Nintendo of Europe has entered into a consultation process on a number of changes it is intending to make to its European business which, in the long term, will better enable the European business to adapt to the rapidly changing business environment. "The measures include the consolidation of the current European headquarters in GroÃŸostheim (Germany) to Frankfurt (Germany), the closure of the warehouse and office in GroÃŸostheim, as well as outsourcing and reorganising some functions. "These intended measures have not been made lightly and have only been arrived at after thorough analysis and careful consideration. The intended measures will sadly have a direct effect on some of the employees based in the GroÃŸostheim and Frankfurt offices in Germany and would lead to the release of approximately 130 permanent employees. "Nintendo of Europe is committed to a fair consultation process with the local Works Council in Germany with the objective of providing clarity and support for all affected employees as soon as possible." 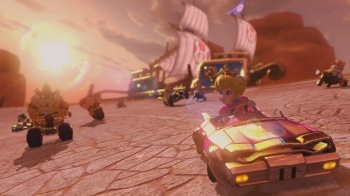 It's a bit of bad news for Nintendo following the runaway success of Mario Kart 8. Given the dismal fiscal results provided by Nintendo last month, though, perhaps it isn't too surprising. Here's hoping those out of a job find work again soon and that Nintendo can continue turning its fortunes at its upcoming E3 presentation next week.